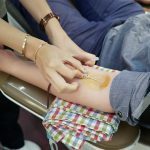 Blood donations decline during the time between Thanksgiving and New Year’s Day when busy holiday schedules cause regular donors to be less available to give and blood drives may be canceled due to severe winter weather. Add blood to the gifts you plan to give this season. The holidays are known for the giving spirit and a hectic pace. 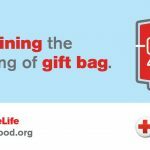 This holiday season, the American Red Cross is sharing three ways to give the gift of life in less time. 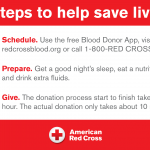 The American Red Cross urges eligible donors to give blood this summer for hospital patients in need, and offers three easy steps people can take to help save lives.